The political hourglass is running out as discussions on unification of right-wing parties seem weary. 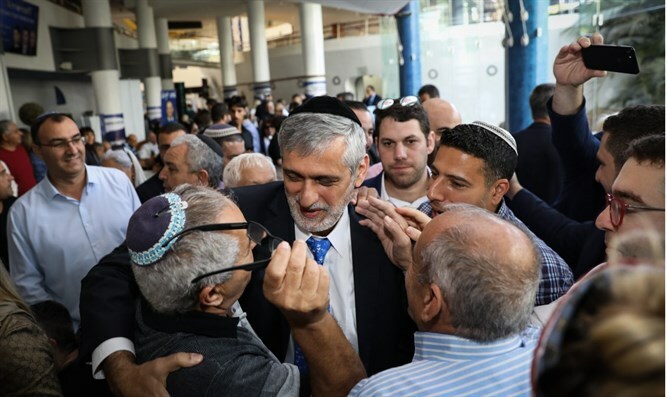 Arutz Sheva spoke with Yachad Chairman former Minister Eli Yishai about his assessment of the chances of unification and what alternatives lie ahead. On progress likely to be made in the talks on the Right, Yishai says he "very much hopes they'll advance, because soon there'll be nothing to argue and quarrel about. Every day that passes is to our misfortune. Everyone has to put his ego on the side, move forward, and be flexible. Whatever issues need closure will eventually get closure." Yishai believes "the potential for a large Right bloc is at least 8-10 seats with good and proper work." However, he says, time is passing and chances of making such an achievement are waning. "At the moment, Jewish Home and National Union are busy closing. I very much hope today it will happen, then they'll have time to move to other parties." As for Yishai himself, he has one or two options, "but I look at the proper and best thing that is a right-wing bloc, which is all in danger. Mina Tzemach's last survey gives me 1.4, Otzma 1, Jewish Home and Tekumah together 2.5, so requiring everyone to 'hang together or hang separately'. Everyone knows that in the background there's the Trump program, to whom we have extraordinary love, but if Netanyahu has no choice and makes a coalition with Gantz as he did with Lapid, it will really be dangerous." As for Benny Gantz's views, Yishai believes he is indeed a Leftist. "There's no doubt his platform and plans are dangerous to the Land of Israel." Yishai was also asked if he saw an alternative to joining the Likud, perhaps as a haredi party within the ruling party. Yishai disregards the question and says in his opinion the most appropriate move is to unite where there is a broad common denominator - that is, the four right-wing parties that he believes would have already reached 8-10 Knesset seats. "I hope we'll succeed in keeping up with this pace, we have to understand what's best for Israel."